Are only one in 70 illegal immigrants in the UK arrested? If recent polls are correct, public concerns about immigration have hit a six year high this year. Today's Daily Express front page told readers that while illegal immigrants were 'pouring' into Britain, less than 1.5% were being arrested by the authorities. Contrary to this front page claim, the Home Office has not revealed that only one in 70 illegal immigrants are being arrested. While its figures show 28,442 arrests were made by immigration enforcement officials between January 2012 and March 2014, it doesn't hold data on the number of illegal immigrants in the country. The estimates by others have varied widely; the one in 70 figure relies on there being 2 million illegal immigrants in the country, while only last week the Express itself put the total at 800,000. The data on arrests may also be incomplete, and doesn't include voluntary deportations from this country. If these are factored in the number of people caught by the authorities increases: last year there were more than 50,000 voluntary and enforced removals from the UK. 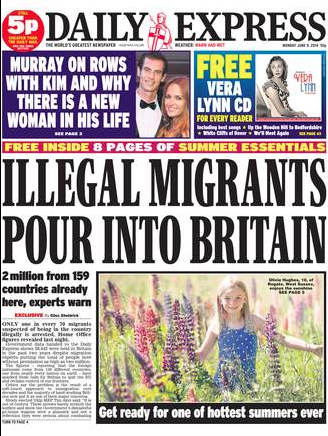 The Express has reached its claim by taking the 28,442 arrests resulting from immigration enforcement visits recorded over a two-and-a-bit year period, and compared it to an estimate of the illegal immigrant population in the UK from the pressure group Migration Watch, which put the total at one million, with a further one million dependants currently living elsewhere eligible to come to the UK in the event of an amnesty for illegal immigrants. The paper has taken this 2 million total and calculated using the Home Office data that just 1.4% of illegal immigrants were arrested, or one in 70. We spoke to the Home Office, who told us that "this is not what we said", and have provided us with a copy of the data disclosed to the Express. There are a number of problems with this claim, but perhaps the biggest is that there is no official estimate of the number of illegal immigrants living in the UK, and estimates of the total vary widely. Just last week, the Express itself reported that there were "800,000 illegal immigrants in Britain", less than half the total given in today's report. The Home Office has said that it isn't possible to quantify the number of people living in the UK illegally, but research done for the Greater London Authority in 2007 estimated that the number of people living in the UK without a right to remain could be anywhere between 417,000 and 863,000, with their best guess being around 618,000. This total includes an estimate for the number of children born here to illegal immigrants, and the upper bound was the basis of the Express's claim last week. Migration Watch took issue with this estimate, saying that its assumptions were flawed. By correcting what it saw as the flaws in this research, it estimated that there could be one million people living in the UK illegally. The Express however has added to this figure another one million, to account for the families or future spouses of these illegal immigrants which Migration Watch said would be eligible to come over to the UK if they were granted leave to remain in the UK. However this extra one million aren't currently living in the UK, so the Express is incorrect to include them in its estimate of the illegal immigrant population. So while we can't say with any certainty how many people are living in the UK illegally, we can say that the Express's estimate misrepresents the research upon which it was based. There are also problems with the way that the Express has used the Home Office data to reach the conclusion that only one in 70 illegal immigrants is arrested. As Ministers have pointed out, the Home Office doesn't hold a complete record of every arrest made on suspicion of immigration offences. The data passed to the Express by the Home Office looks only at those arrests made as a result of visits from immigration enforcement teams, a caveat highlighted in the FOI release. It won't include arrests made by police forces separately to these visits. The data also counts the number of arrests, not the number of suspects. One person could have been arrested several times over the period the data covers, so it isn't correct to use these figures to try to construct a ratio showing the proportion of illegal immigrants arrested, as the Express has done. These figures are also a poor proxy for the number of immigration offences detected by the authorities. Official data shows that over 50,000 people were deported in the year to March 2014, with a majority of these cases being done on a voluntary basis. It's impossible to accurately calculate the proportion of illegal immigrants that are arrested by authorities, because there is no reliable data on the number of illegal migrants living in the UK. However the Express's estimate is not supported by the research it cites, and the Home Office data it 'revealed' cannot fairly be used in comparisons of this kind. We will be contacting the Express to ask that the story is corrected as quickly as possible. Does the UK subsidise the upbringing of foreigners' children?